It’s coming on Christmas – so sang Joni Mitchell, and indeed it is. As usual, it’s caught up with me long before I’m ready. However, if your friends or family enjoy poetry, you might consider buying one or two of 4Word’s wonderful selection to pop in their stocking this year. We are proud to announce the addition of the wonderful Mary Norton Gilonne to our talented group of poets, with her forthcoming pamphlet Incidentals, due to be launched on December 1st. 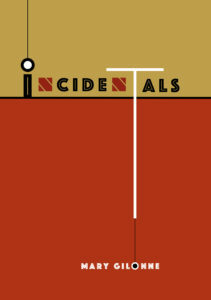 Incidentals is our fifth pamphlet, along with Androgyny by Kevin Reid, After Eden by Stella Wulf, Black Bicycle by Lesley Quayle and Girl Golem by Rachael Clyne and, as a set, they are not only fantastic to read but, thanks to Claire Jefferson’s stunning covers, each is a work of art. The pamphlets cost £5.99 (plus p&p) and can be ordered either via 4Word or direct from the poets themselves. Incidentals is available now for pre-ordering. See www.4Word.org/titles for details.